Hanging an LCD TV or Plasma screen is one of those tasks that most people would prefer to have a professional do for them. Choosing a suitable bracket. Some customers do want to have the cables and wires hidden within surface mounted trunking or actually sunk into a wall or chimney breast. Although cable management is not part of the standard LCD or plasma installation; it is an additional service that we offer. We supply all the tools, fixings and screws needed to install your TV screen securely and professionally. 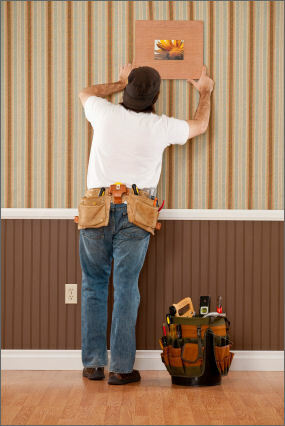 One of the many small tasks London Handyman Service undertakes is the hanging of pictures, paintings and mirrors. No matter what the size, shape or value we always ensure anything you need hung up is secure, safe and straight. Hassle free blind and curtain rail installation. If your blinds need to be cut to size, expect each blind to take 25-40 minutes to fit.